Ah what a beautiful view of smokestacks you get from the Marketing office. This is the track that plays when you visit the Marketing Division in the classic automobile company game, Detroit. Here you're able to spend money on advertising your cars either on billboards, magazines or even at sporting events. It's similar in style to most of the Detroit soundtrack, decadent, pompous and audacious - just the way you like your cars right? 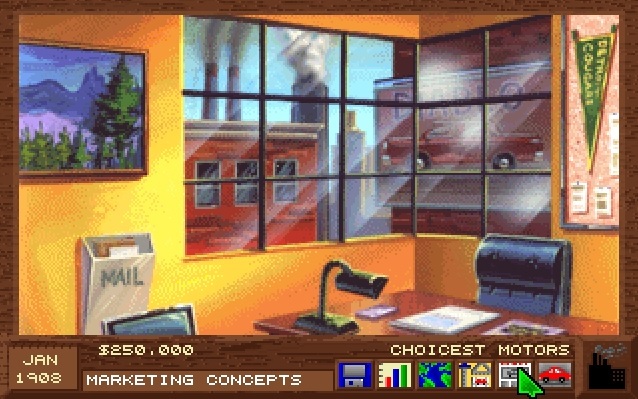 The music was recorded through DOSBOX and consequently this is DOSBOX's emulation of OPL3 I believe, the FM synthesis sound chip used in a lot of old Soundblaster cards.